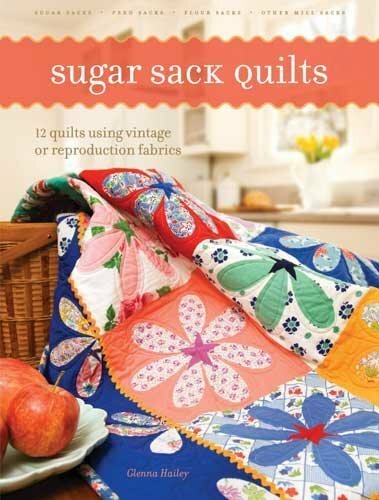 Hollyhock Quilts: NEW!! Polka Dots & Baskets Feedsack Quilt Kit and Tutorial Now Available! NEW!! Polka Dots & Baskets Feedsack Quilt Kit and Tutorial Now Available! Welcome! I just finished this sweet little 31" x 31" quilt and it is now available as a kit using AUTHENTIC VINTAGE FEEDSACKS. It's fun and quick to make! A tutorial is included here which will take the place of printed instructions. You may print the picture below as your reference. Easy, huh? The kit is $39.95 plus Shipping. 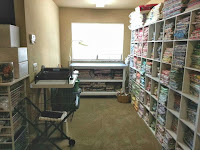 International customers may email me at hollyhockquilts@gmail.com for costs. More info below the pic. PLEASE NOTE: Each kit will be different. If you trust me to pick out your pretty baskets, please feel free to order here. The Baskets will be chosen especially for the project, but the Dots and Scrappy Strips will be from what's available. If you want to see the specific baskets included in a kit, please go to my eBay Store. I'll be listing kits there that contain the baskets as shown. If they are sold out, just keep checking back. 1. (4) Pre-fused Feedsack Baskets using the BEST fusible product on the market, Soft Fuse. It is so light and soft that you can barely tell it's there. 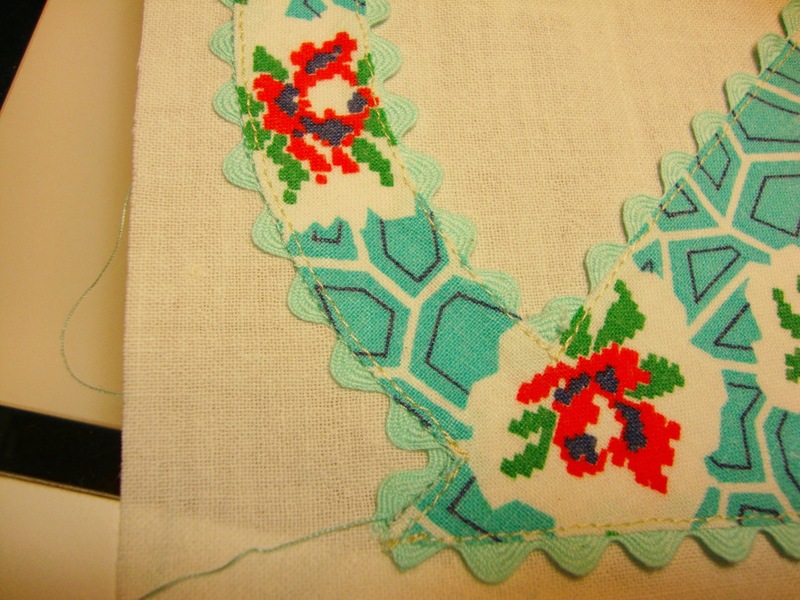 I like to use a fused applique to keep the raw edges from raveling. 2. (75) Pre-fused Feedsack Dots. A few more than you need. 3. 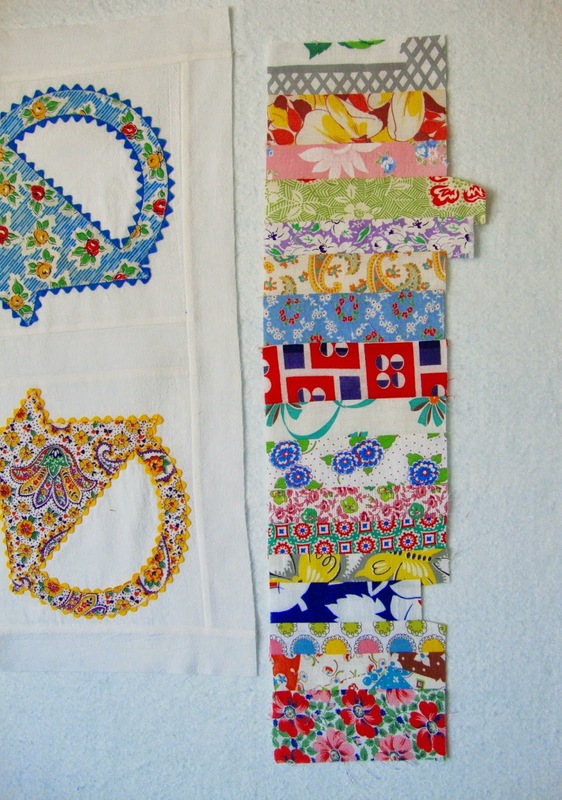 More than enough Scrappy Feedsack Strips to make the Border. 1. About 3/4 yard Background Fabric. 2. Rickrack is optional. If you want to use it, allow about 1 yard medium size per basket. 3. (1) yard Backing Fabric. 4. About 1/3 yard Binding Fabric. The Rickrack is optional. 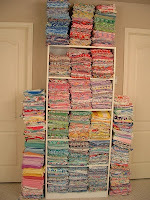 If you want to use it, apply the Rickrack to the Baskets by sewing it as close as possible to the edge of the Basket. You will have to cut and start with a new piece at each turn. It's a little bit tedious, but I loved the end result! Next, you'll fuse the Basket to a Background Block by lightly pressing the block diagonally. Make sure you don't pull or stretch the fabric. Then, finger press the basket in the center and align it with the background as shown here. Make sure you leave adequate room for 1/4" seam allowances all around and press. Secure the Basket by sewing along the Rickrack Edge with a matching thread. 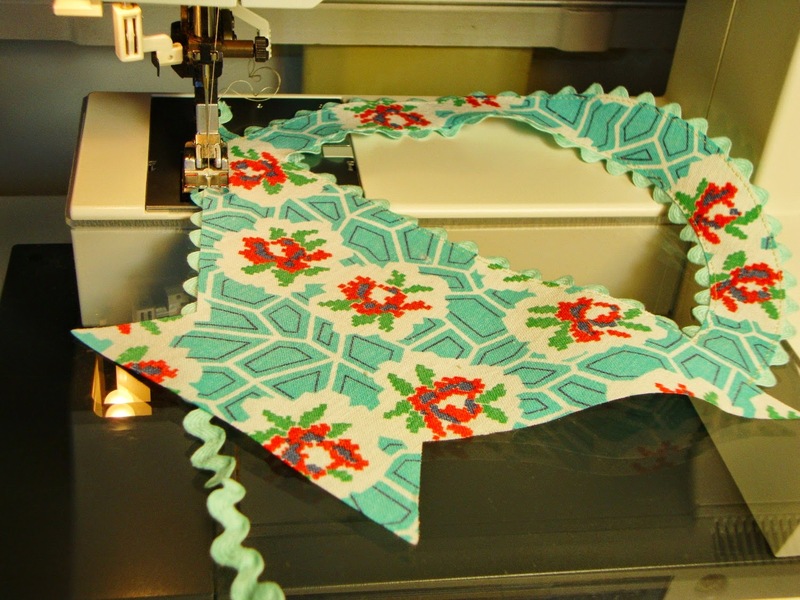 If you aren't using Rickrack, just sew along the raw edge by hand or machine to secure. 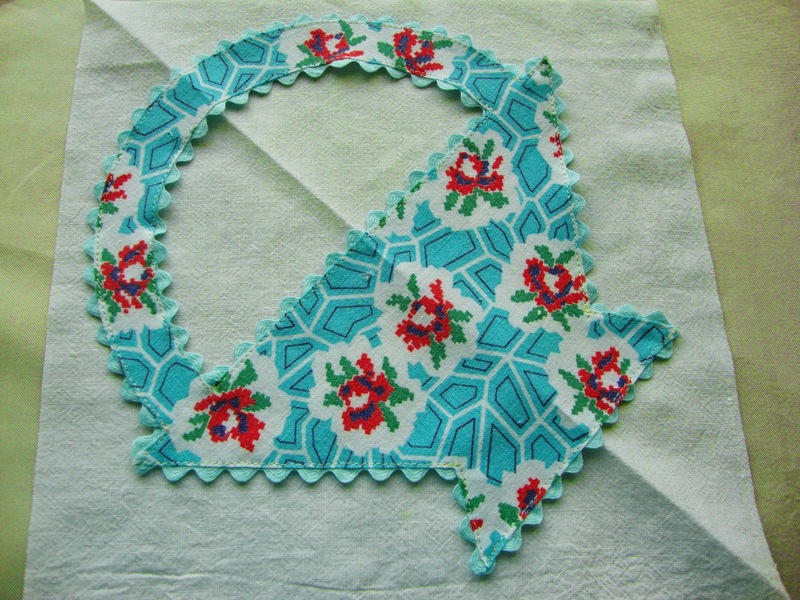 A straight stitch or a blanket stitch will work just fine. Arrange the 4 baskets as you like them. Sew the Left 2 Baskets together with a 2" x 9 1/2" Strip between them. Do the same with the Right 2 Baskets. Then sew those 2 units together with a 2" x 20" Strip between them. Add a 2" x 20" Strip to each side. 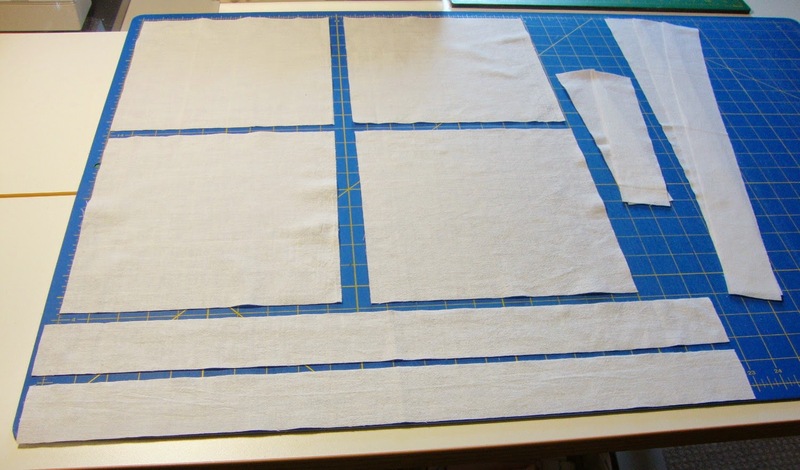 Lastly, sew a 2" x 23" Strip to the top and bottom. Refer to the full picture at the top for reference. NOTE: I got excited to see the Dots at this point, but I suggest waiting until the top is complete with the borders before you add them. It's easier to center them in the Strip if you wait! Trim the straighter edge first, then cut the Strip to measure 4 1/2" x 23". Make FOUR of these and attach TWO to the sides as shown. Remember that you won't have any dots yet! Sew enough Feedsack Strips at least 5" long together to measure just over 5" square. Do this 4 times. One edge will be uneven as with the long strips. Square each of these Blocks to measure 5" Square. IMPORTANT! Turn the 2 squares on the Right to run Horizontal while the 2 squares on the Left will remain Vertical. Then cut each square on the diagonal as shown below. Now, rearrange the blocks so that you have half vertical strips and half horizontal strips. This is the magic part! 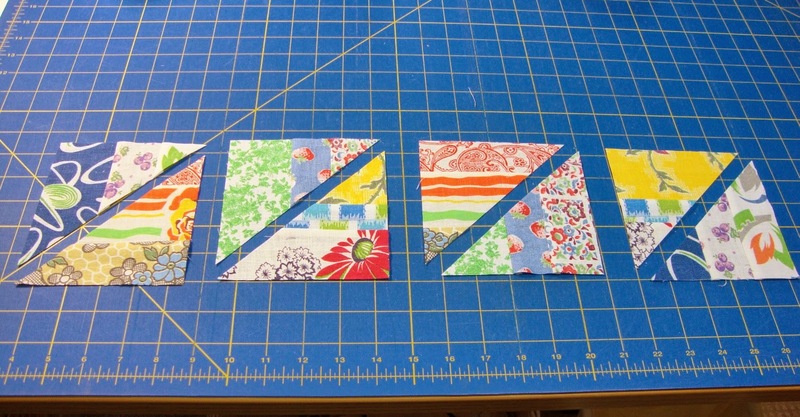 Sew these blocks together and press well. I like to press the seam open on these. 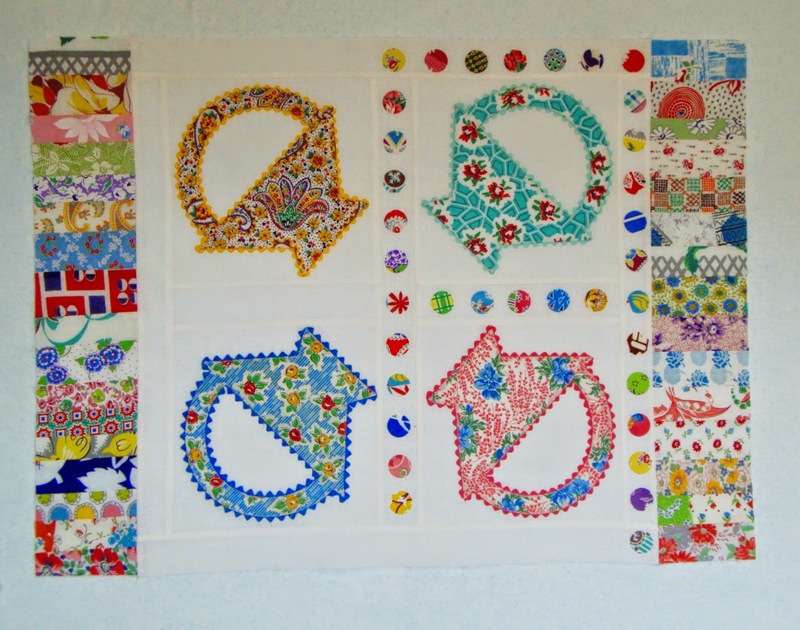 Arrange them as the reference picture shows and sew one to each end of the 2 remaining 4 1/2" x 23" Border Strips. Voila'! It looks like you spent hours trying to do mitered corners!! 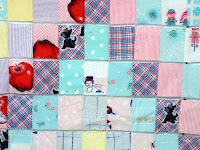 Sew the 2 Border Strips to the top and bottom. NOW is the right time to add the dots. Space them out as shown and work in small sections so they won't move around on you. When you've placed them as you like, press them to secure. 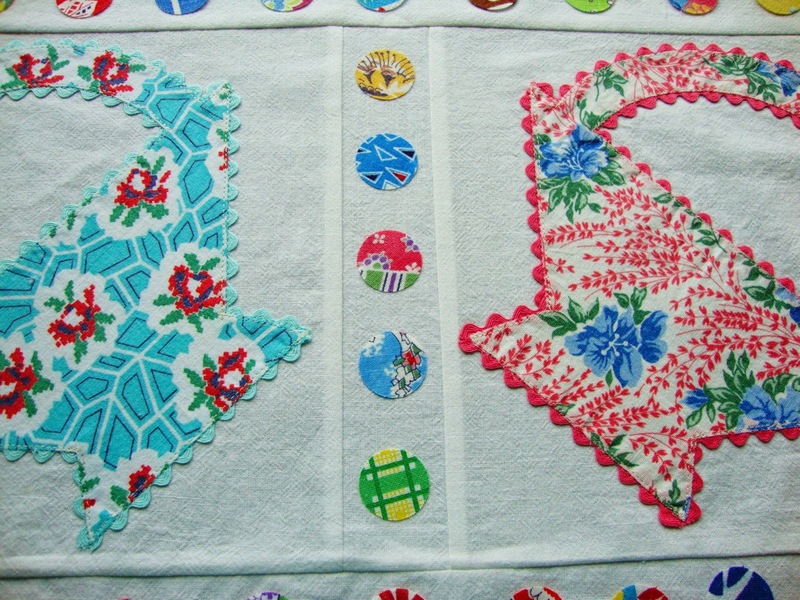 You can stitch around them now by hand or machine or wait until you do the quilting. Your top is done! 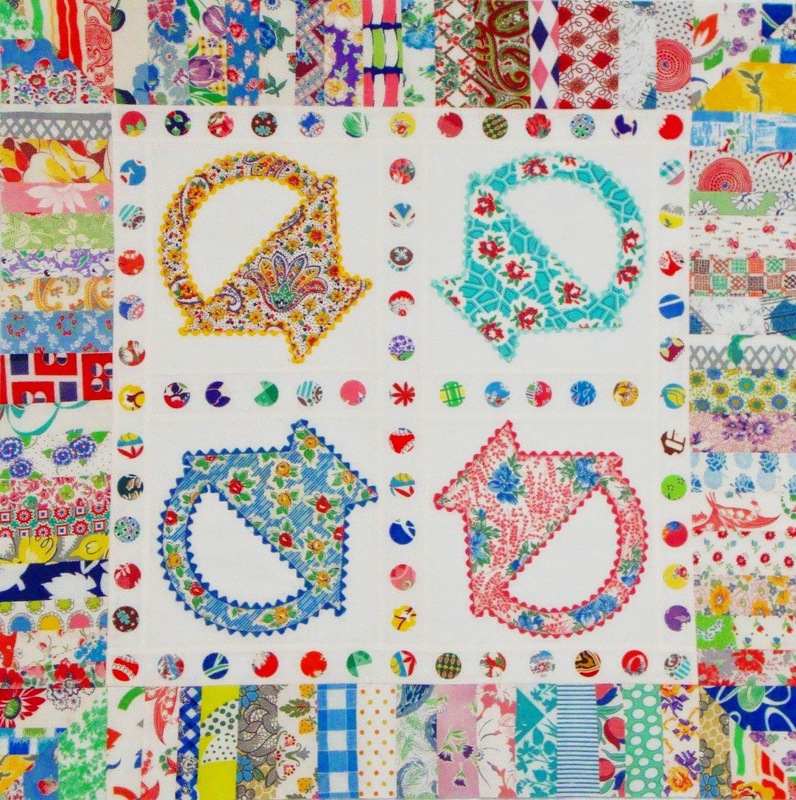 Quilt as desired and apply the binding as you normally do. Enjoy!